Readers live in a digital world. A world that does everything it can to distract them from reading books. Apps, computers, social networking, and the internet, pull the eyes of a reader from a book every day. Just when the author is starting to draw them deeper into their world, a text or internet search drags their attention away. Once a reader is gone, it can be challenging for a print book to attract their attention again. As a result the reading sessions of some books are abandoned in favour of digital distraction. To counter this, publishers around the world have focused on marketing campaigns and inventive technologies to keep the reader interested in the printed book. In Argentina, one publisher prints their books with vanishing ink to keep the sense of urgency constant. 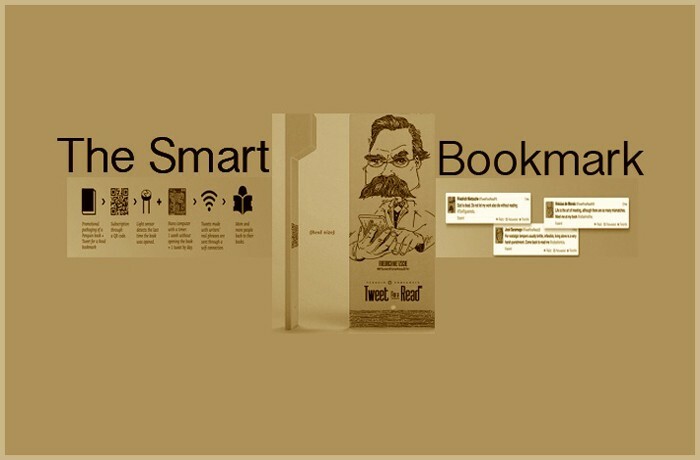 But in Brazil, Penguin-Companhia have developed their own product to ensure a reader always finishes a printed book: the smart bookmark. Fitted with a miniature wifi computer, a light sensor detects when the book has been closed, and a timer monitors for how long. If the book has been abandoned for more than a week, then the bookmark tweets the reader a reminder to return to their reading. To further entice and amuse, each tweet is composed in the style of the author and even uses phrases from the book itself.